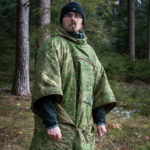 I have to tell you: The moment I received my Bark River Boone, I already was really tempted to run into the forest to play Cowboy and red Indians. As I took the Teddy II out of the box and into my hands, I immediately felt like I was at Alamo with James Bowie and Davy Crockett. The shape of the blade is that of a classic bowie like one would imagine. 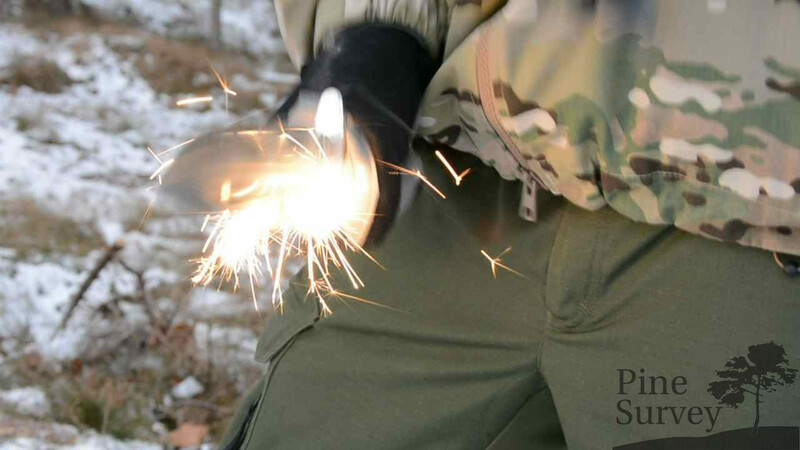 The spine is edged to use it with any firesteel. 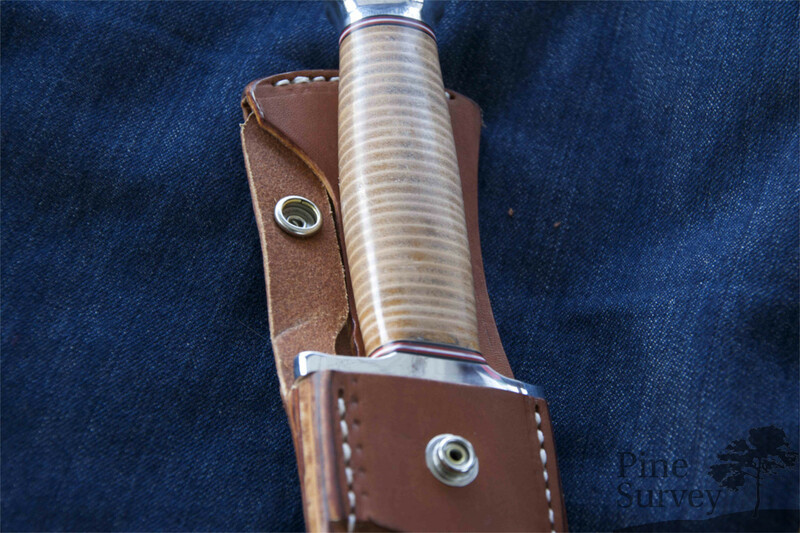 You won‘t find any jimping, but you will definitely find some nice „blood“ grooves on both sides of the blade that take some of the weight away. 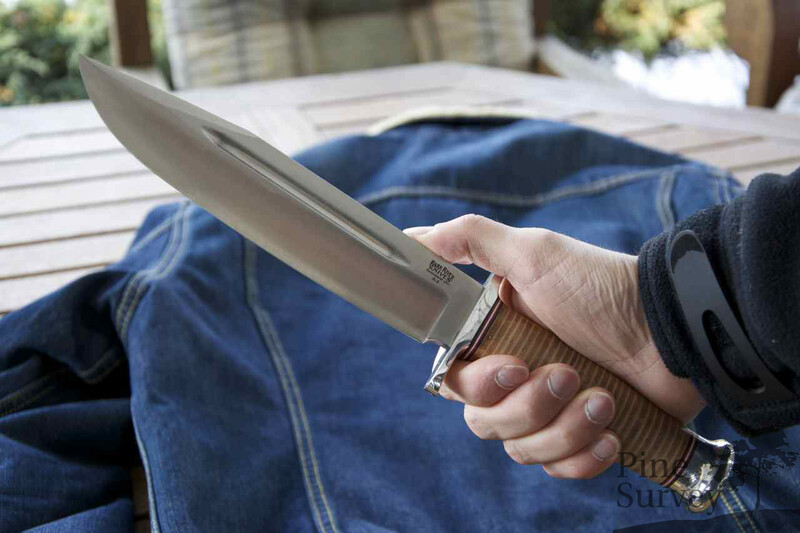 The edge of the blade is curved from the tip to the guard, meaning there is no straight part of the edge. This in combination with the convex grind is making the knife crazy sharp and eager to cut. 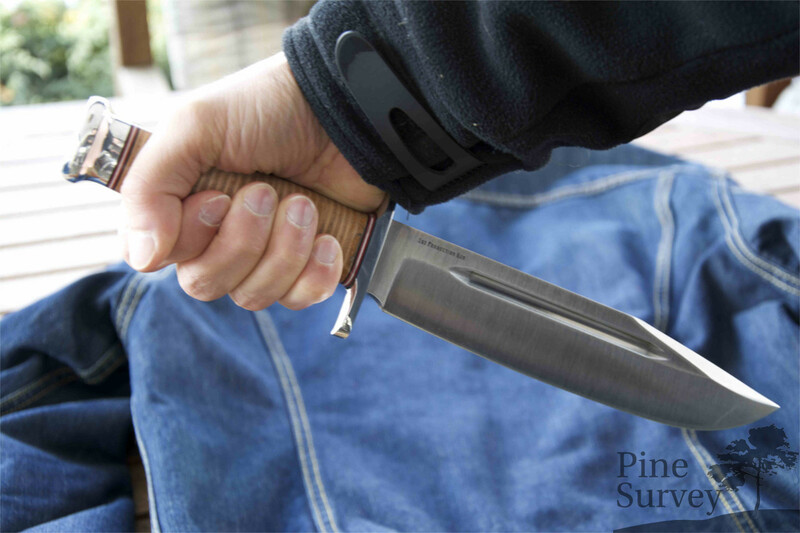 A two sided guard is protecting the hand against an accidental slide into the blade. 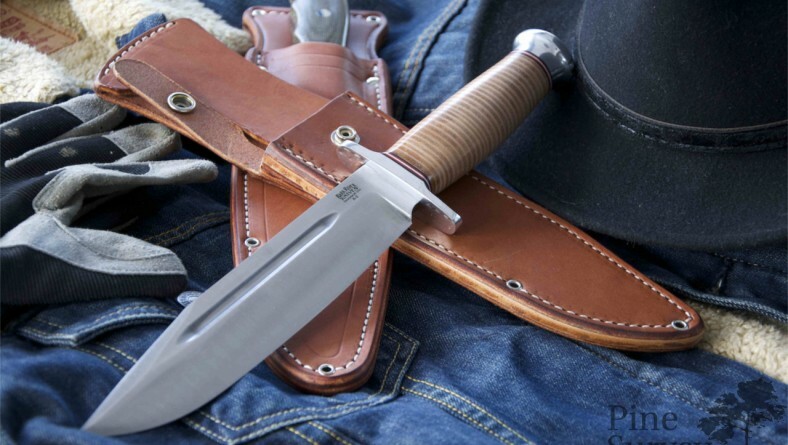 At the same time this design element is giving the knife the appearance of a combat knife even though one will consider this knife more as a wild west knife than as one of the pacific theater. This version of the Teddy II has a handle with stacked leather washers. 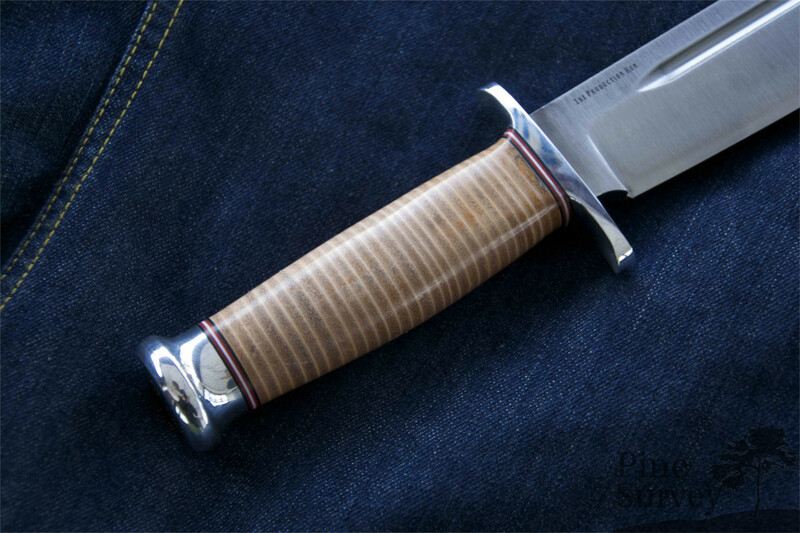 Additionally you will find some classic fiber inlays, which are adding to the knife‘s traditional charm. The knife feels warm in the hand and strong. The handle fills the hand entirely and has enough room even for bigger hands. 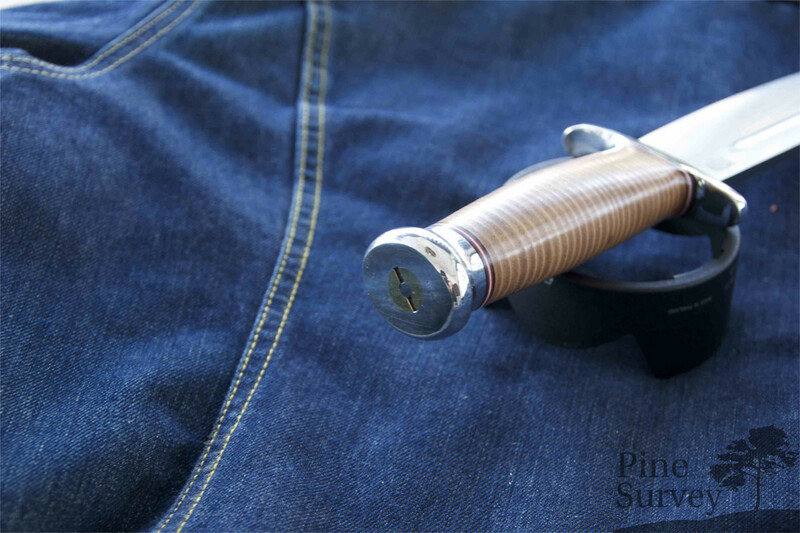 The pommel is made of aluminium and has a screw inside, which connects the handle with the tang of the knife. 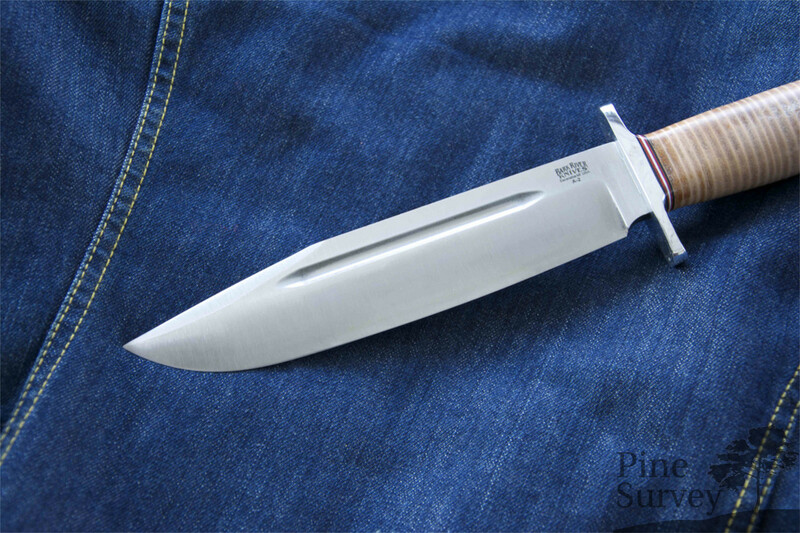 The Teddy II is not a full tang knife of course, but one should not have the fear of a possible failure of the tang. Everyone who will handle this knife will understand this without much explanation. 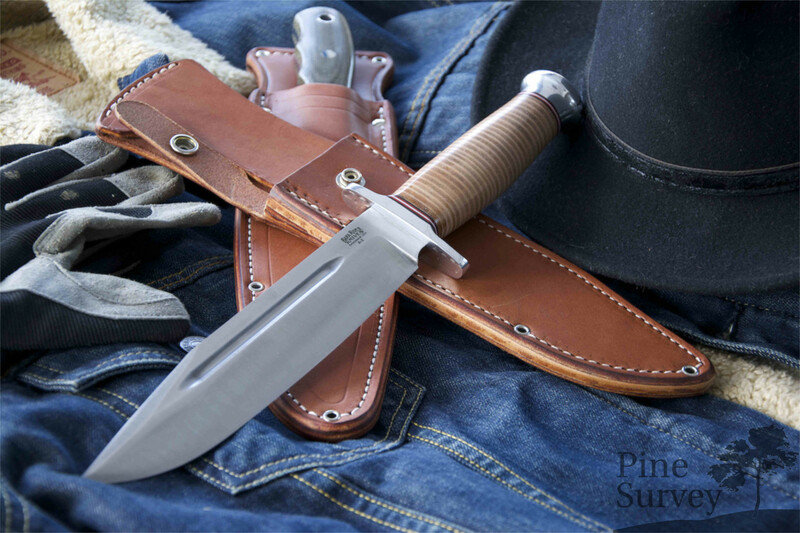 Basically one can argue that the knife features historical aspects of the „Wade and Butcher“ knives of the late 19th century. I have already written about that in my review about the Bark River Boone, the smaller brother of the Teddy II. 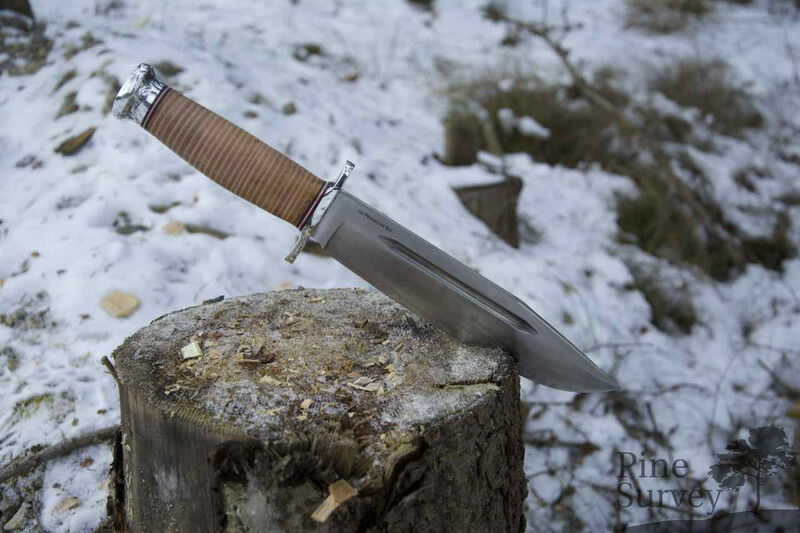 In a nutshell: This design and its various variations are the origins of the American combat knives that accompanied the Marines in the Pacific and other theaters of war. This recognition value is clear to see with the Teddy II as well and I cannot imagine that this knife does not trigger some memories in any person. Somewhere, somehow everyone of us has seen this kind of knife before. 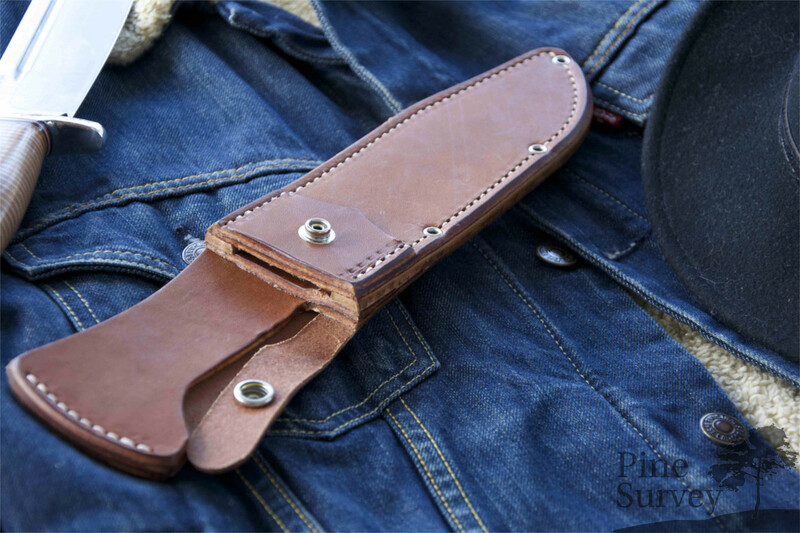 The sheath is made of high grade, thick leather. It is sewn up once and riveted. 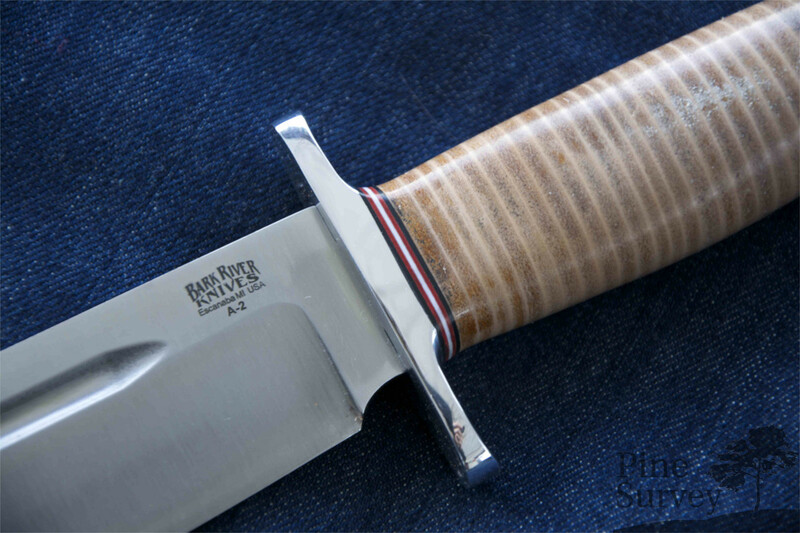 The strap that secures the knife runs over the guard, like with most of the Bark River Knives as instead over the handle. 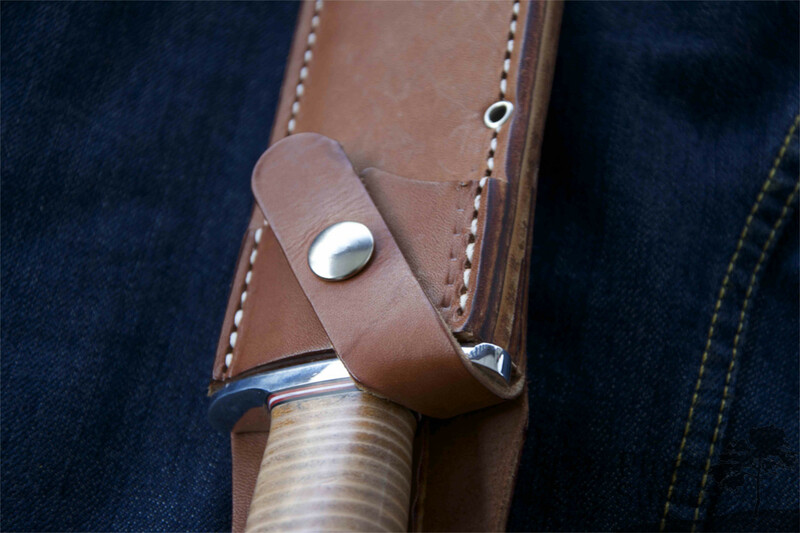 If you release the strap you can put it into an opening of the belt loop and prevent any damage to it from the blade. 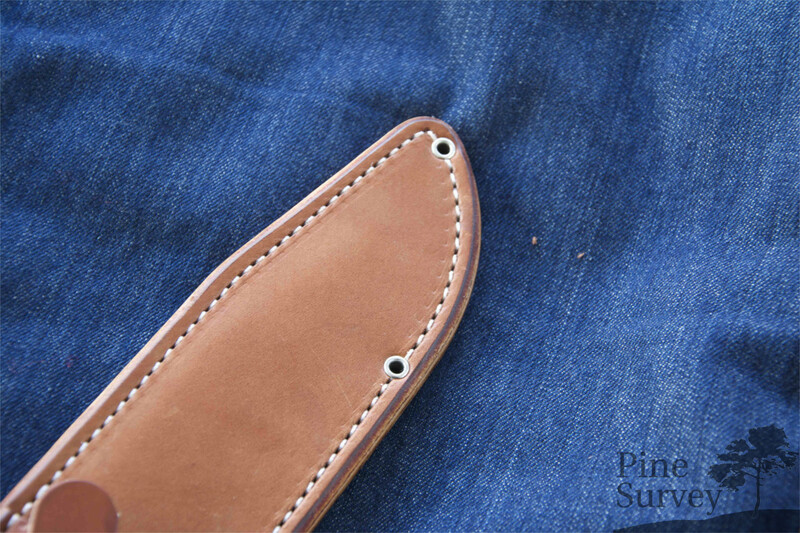 The rivets, which are put in place on a regular basis to support the seam, all feature a hole in the middle. Theoretically it would be possible to run a cord through these holes to gain an additional option for attaching the sheath to your gear. 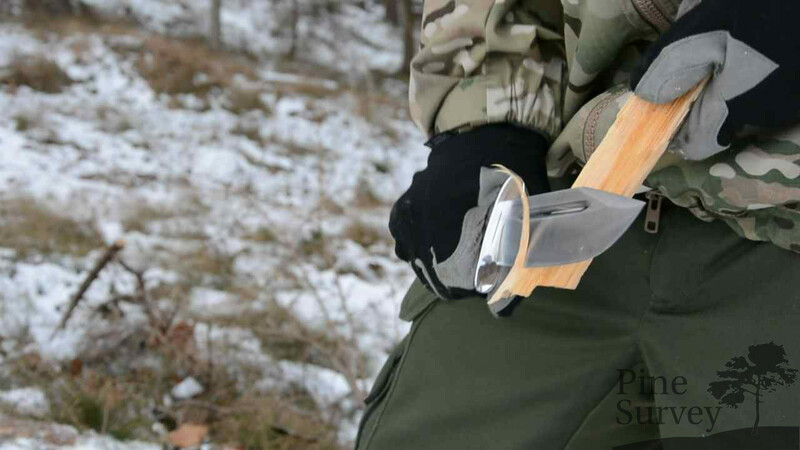 The knife carries surprisingly very comfortable on the belt despite of its weight of almost half a kilo. It should come to no surprise though. The weight is distributed nicely on the hip via the belt. Not until longer tours one might realize the weight. But let us take a look at the knife in practical use. Because of its size and shape of the blade it performs outstanding well as a chopping tool. An arm thick, dry branch was chopped through in a very short time. Also batoning was absolutely no problem. As a result of the long blade one has enough space to baton and the convex grind does the rest of the work in combination with the mass of the knife. Shortening sticks with slashes was really easy as well. A one inch thick hazelnut stick was cut through with one blow. This is frightening, honestly! The tip of the knife is very robust because of the grind and the construction. Stabbing and drilling into the wood had no effect on the tip. Even joints and bones should not be a problem in this regard (if you want to process an animal). Fine carving work is getting a little problematic though because of the size; either that or they require special gripping techniques. 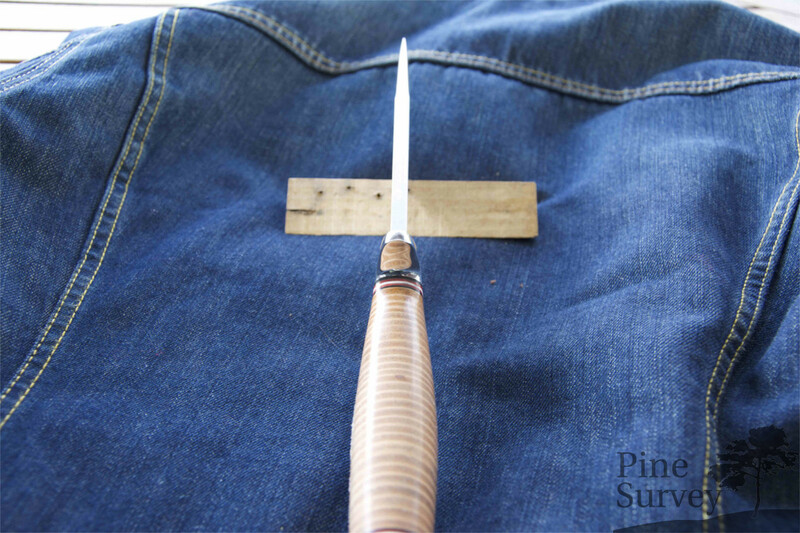 A manual shortening of sticks is possible because of the sharpness of the blade, but tiring because of the size of it. As you can see in the video though, carving of feather sticks is no problem. One just has to find his technique. In general the knife is fast in the hand. It is also top heavy. The point of balance is in between the ricasso and the start of the edge. Since the knife is big enough and has a large pommel, it just screams for tricking around with it. Ultimately one can say once again that the edged spine allows the use of firesteels. All these remarks can be looked at in the video, which should be seen as an addendum to this review. Let‘s come to the conclusion. My honest opinion about this knife? For the very first time in my life I have reached the point where I have to recommend everyone (and I mean EVERYONE) to get this knife. Why? I cannot explain it to you in an objective or rational way. I am sorry, but it is like that. The knife is in its own way a construct which is just right in any way. Shape, execution, (historical) background, material, bang for the buck. And it put a smile on the face of everyone I gave it to. The size is ridiculous, but it never could be any smaller. One can argue about sense and nonsense of big knives. Especially in Germany and times like these when there is a nonsensical german legislation – thank god I am living in Austria! But I am going off topic. Chopping, cutting, batoning, limited fine carving work…. you name it. One could get as far as going into metaphysics and argue that this knife has a soul. And by god, it has. With that I leave you to it and stop preaching. Thank you for your time and patience. Hopefully the words and pictures are to your liking. 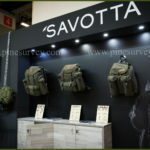 Last but not least I would like to say my sincere thanks to „hanomag“ of the german Tacticalforum, who sent the knives to me for this review. At the same time I want to curse at him for hooking me to it. Shame on you! Also much thanks to Jenni from Klingenwelt who distributes the knives in Europe and forwarded them to me!